Donald Trump is easing up on unsupported claims of success over North Korea’s nuclear program, days ahead of his second summit with Kim Jong-un. 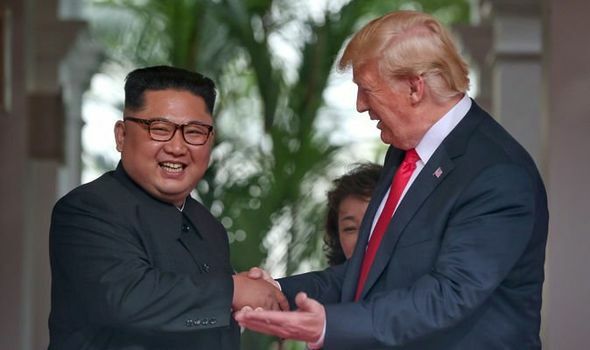 Looking for a PR triumph amid multiple difficulties at home, from his failed Trump Shutdown to the advance of the Trump-Russia investigation and other criminal inquiries, Trump has scheduled a meeting with Kim in Vietnam this week. After last June’s summit in Singapore — the first ever between US and North Korea leaders — Trump declared immediately that the North Korean nuclear threat was over. But American intelligence services have concluded that Pyongyang has done little to slow the weapons and missile programs. US and North Korean negotiators have failed to agree even on a basic definition of “denuclearization”. At the end of January, Director of National Intelligence Dan Coats testified to a Senate committee that North Korea is maintaining its nuclear effort. An angered Trump reportedly denounced Coats, leading official to fear that the former US Senator might be fired. Senior Trump aides privately say they are doubtful that any deal can be reached to build on the symbolic, vague declaration issued in Singapore. Some are telling the media of concern that Trump may be pressed to make a major concession during face-to-face talks, so he can claim a political victory. At the end of the Singapore summit, in the only substantive outcome, Trump surprised US officials and the Pentagon by declaring an end to decades of joint military exercises with South Korea. Last week Trump damped down any prospect of North Korea scaling down its nuclear programs, saying he is in “no rush” as long as there is a moratorium on testing of nuclear weapons and missiles. “I have no pressing timetable,” Trump said, while presenting the achievement of more meetings with Kim after this month’s encounter. Having achieved nuclear weapons and long-range missile capability, North Korea suspended testing in November 2017. The summit on Thursday will come soon after Michael Cohen, Trump’s former lawyer and fixer, testifies before three House and Senate committees. The testimony could add to Cohen’s statements that Trump was involved in the criminal activity of paying off two women claiming sexual encounters, and that a Moscow Trump Tower was pursued with Russian contacts up to June 2016. A series of foreign leaders, such as those of Saudi Arabia, Russia, and China, have seen the value of flattering Trump in summits, gaining leverage while helping Trump divert attention from troublesome issues.